A large rockslide has blocked one of the main roads into Yosemite National Park that will remain closed at least through the weekend, an official said Tuesday. YOSEMITE NATIONAL PARK, Calif. (AP) — A large rockslide has blocked one of the main roads into Yosemite National Park that will remain closed at least through the weekend, an official said Tuesday. About 4,000 tons (3,600 metric tons) of rock detached from a cliff on Monday, blocking El Portal Road, park spokesman Scott Gediman said. El Portal Road is a continuation of Highway 140 and the gateway for about a third of the park's visitors who enter from the foothills above the Central Valley. About 700,000 to 800,000 visitors use that entrance each year, Gediman said. "This massive slab of rock slid down the cliff, hit a ledge, and broke into many pieces," he said. 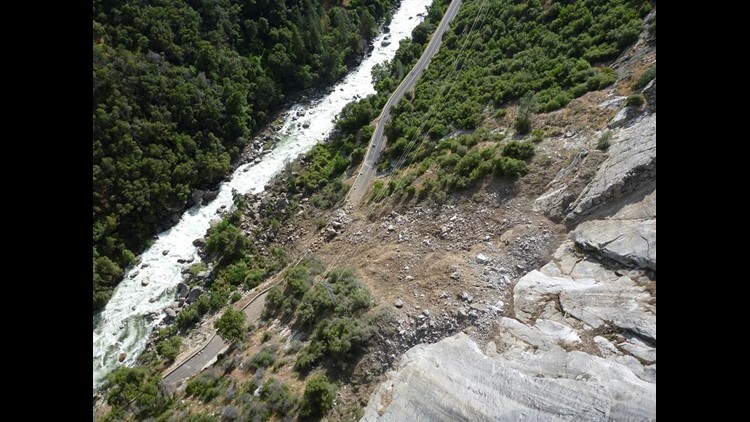 Those pieces fragmented further after hitting the base of the cliff and fanned out over an area more than 1,000 feet wide with debris rolling down to the Merced River. The park can still be reached by way of Highways 41 and 120. The three entrances on the west side of the Sierra lead to Yosemite Valley, the park's main attraction. The closure cut off the valley from the village of El Portal and the city of Mariposa, which are home to most of the park's employees. Commutes that typically take 30 minutes to an hour are now taking two to three hours, Gediman said. The park's eastern entrance is still closed as plow crews clear near-record snowfall on the road to Tioga Pass, which sits at nearly 10,000 feet above sea level.